The picture is from April 19. My niece, Callie, was visiting grandma. 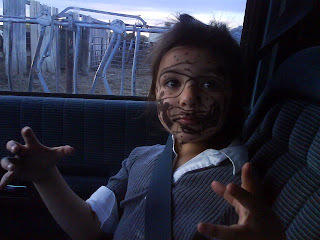 She got into the mascara. 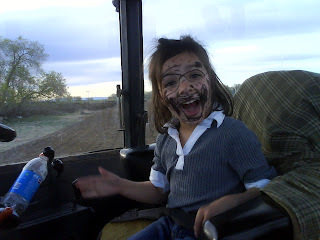 I don't know if that had anything to do with grandpa bringing her out to ride in the tractor with uncle but that is where she wound up. She was in good spirits and happy as ever to show off her makeup job for the camera. Later, as we were leaving the field we drove through the feed alley of the dairy. We were stopped by the milkers taking a string of cows into the barn. As we waited for the cows to pass Callie looked at me and said, "Uncle, I just saw a cow over there and her 'gutter' was this big!"